Good All. 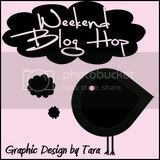 As I was out blog hopping I ran across this blog http://art2theextreme.blogspot.com/ . This lady has some great finds. Like I learned about the Etsy Treasury Widget from CraftCult.com. You can post Treasuries your in or that you have made. These are two treasuries we are featured in out of 29. Also, be sure to check out the Recycled Mittens on Art2 The Extremes Blog. Afterlife Rejects are Weird, Strange, little Dolls. OOAK and handmade. Rejects are born with open hearts, minds, and arms. Use your gift certificate to pick your own Reject, have a custom Reject made for you or someone fabulous, or accessories for your Reject. Check out our Custom Rejects Page for ideas. 2. Take a jog over to the Afterlife Rejects Store and pick your favorite Reject. 3. Leave us a comment telling us the name of your favorite Reject. 4. We would love it if you shared our contest on Facebook, Twitter, or your blog. And we will give you an extra entry for each place you share. Leave us a comment letting us know where you shared. I will contact the randomly drawn winner on February 1st. Winner will have 3 days to contact me, then I will draw anouther winner. 1. What movie can you quote like a Star Wars fan would his? 2. What movie line got stuck as common use in your home. 3. What movie are you kind of embarrassed that you love. - Mine is 'Step Brothers'. I know it's sooo immature, but I still laugh my tail off. So Cat and I decided to stir things up a bit and have a big sale this weekend. We have added over 50 new items to the store since Christmas, including boys, girls, playsets, and Omys Dolls and Bears. For everyone who is not local here's what it reads. Tucker has sold is now on his way to Texas to live with another Reject named Sadie. 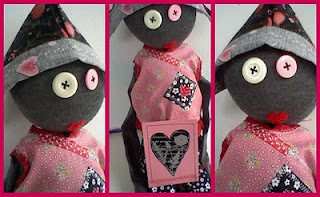 Cuddlebug comes all dolled up in sailor hat, dress and pants with here own Valentines Day Card. Giveaway Ends January the 14th. Be sure to check out the rest of The Crazies Blog! Afterlife Rejects are Weird, Strange, little Dolls. OOAK and handmade. Rejects are born with open hearts, minds, and arms. Reject Dolls are oddball individuals. Afterlfie Rejects were born due to our Economy. I am a Painter and sold art. But when the economy started to roll down hill people could not afford expence art. Then the main highway through our entire area was closed for over six months due to a rock slide and all tourist traffic to the area went with it. Lots of local buisness closed down including a Ryans, Rental stores, clothing stores, and Rafting companies. We had to think quick. What can we make that only the locals could afford and would buy. After several trail and errors Afterlife Rejects were born. It was a little over a year age that Afterlife Rejects first hit local stores and fairs and they were a big hit. So we decided in October of 2010 to go worldwide and open our Etsy Store. Within days of opening our store we had a family emergency and delayed our big opening untill just before Black Friday. We discovered the World loves Afterlife Rejects as much as we do and we struggled to keep up with sales during December. Afterlife Rejects are run, owned, and operated by our creative family members. Mom (thats me - Sidhe Kalas, two daughters (Catilyn and Naomi) and our son (Laurence), even the daddy (that would be my hubby) gets the help stuff on busy days. We live in the heart of the Smokey Mountains between Knoxville, TN and Asheville, NC in the great metropolis of Cosby, TN. Cat and I take care of most all Reject Business and Naomi now has her own line of crazy dolls called OMYS. We are a very close knit family. It is normal for us the have to wait weeks in scheduling vacations so that the grown kids and grandparents are all included. Our favorite vacation is a day trip to the zoo or the hour and half ride to a city big enough to get some organic food. lol We are foodies at heart and have a house that is so full of books that it looks like a library.